Why not book a lounge at one of Heathrow's 4 terminals and relax in a little comfort or take the opportunity to catch up on some work. All lounges have flight information screens. Luggage can not be left unattended at any time. You can spend up to three hours in the lounge. 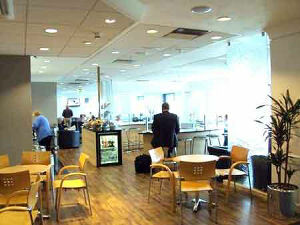 The lounge can be found at International Arrivals at Terminal 2 (The Queen's Terminal). The lounge is able to accommodate disabled passengers and even offers a disabled shower. Children are welcome in the lounge and those under 2 years old may enter for free. Premium drinks, such as champagne and cognac, cost extra, at the lounge's discretion. You can check in to the lounge up to three hours prior to flight departure. The lounge provides a TV and flight information display screens so you can be entertained while you wait to board your flight. Take some time to relax with the selection of newspapers and magazines and avoid the noise of the public lounge. The lounge is accessible to wheelchairs. However, there is no disabled toilet - the nearest is located in the terminal. The lounge has a smart casual dress code (no baseball caps or football shirts, and tailored shorts only). Children of all ages are accepted into the lounge. Before 11am only continental breakfast items are available. As long as you are flying from Terminal 3, you can use this lounge. Beer and wine are included in the complimentary drinks. The lounge provides complimentary snacks (biscuits and crisps), coffee, tea, soft and alcoholic drinks. alcoholic drinks is limited to 2 per person. there is no smoking area within the Lounge. Heathrow Airport is Smoke-Free. There are no shower facilities in the lounge. You need to be 18 or over at the time of travelling to enter the Lounge un-accompanied. There are toilets facilities in the lounge. luxurious No.1 Lounge at Heathrow. Serves freshly-prepared dishes from the bistro menu. Options include a spa treatment, a glass of champagne, a board game, a film or a game of pool. There's a family room for enjoying some quality time in, and a 'Snug' room to catch some sleep or even bedrooms for some real sleep. The lounge is airside at Terminal 3. After you have gone through security, follow the walkway to the left of World Duty Free, and then follow signs for airport lounges and Gates 13-22. 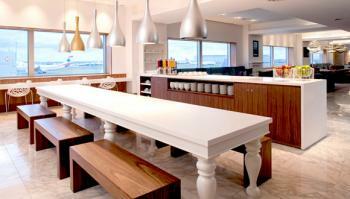 The No.1 Lounge at Heathrow is one floor up. Children Children of all ages are welcome at No.1 Lounge at Heathrow. Children 12 and over are classed as adults and will need to pay the adult price. the lounge has flight information screens to keep you up to date. Complimentary breakfast is served from 4.30am to 11am - items on the menu include a choice of cereals, and natural yogurt with berry compote and granola. Other options at different times of the day include warm rolls with either sausage, bacon or omelette, a selection of fresh fruit, fruit salad, rustic breads, cheeses and pastries. The lounge does not have shower facilities. You can spend up to three hours in the lounge before your flight. After you've gone through the security, head to the main departure hall. Turn right and follow the signs to the SkyTeam Lounge. It can be found opposite Gate 10. The lounge has a smart casual dress code. Children are allowed in the lounge. Smoking isn't allowed anywhere in the lounge. Turn left after security and head to Gate 1a, where you should see the lounge next to it. The lounge is able to accommodate disabled passengers. Children are welcome in the lounge. You can choose either two glasses of house wine or two glasses of draught beer to enjoy free with this package. There is a charge for any extra alcoholic drinks.